Our baby is twenty-one weeks old. It’s thirteen weeks since its heart started beating. It pulls faces – it can frown, squint, grimace. It has tiny finger-nails. The bones in its ears have begun to harden, so it can hear what’s going on around it. Researchers say that by now it knows mum’s voice. It senses her moods and reacts to them. It responds to familiar tunes. The psalmist wrote: “You created my inmost being; you knit me together in my mother’s womb. I praise you because I am fearfully and wonderfully made; your works are wonderful, I know that full well.” (Ps 139: 13-14). He was overwhelmed when he thought about the mysterious way God shapes a baby in the womb. So am I. An unborn child is an awesome and wonderful thing. 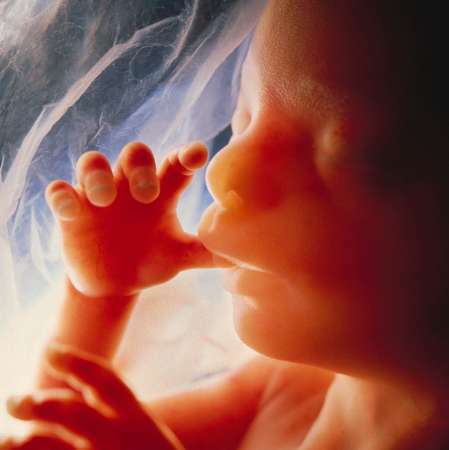 186,000 unborn children in England and Wales were put to death by a variety of methods in the year 2000. (The 2001 figures are slightly higher). It’s hard to take in such a figure. (I think of a school playground with 500 children running round shouting and playing. Each year we are killing enough children to fill 370 such schools). Most (88% in 2000) were aborted before they reached 13 weeks. But 2,555 were aborted at 21 weeks or more. They were babies just like ours. 9 were killed at or after week 34. At that stage a baby is small but well able to survive outside the womb. In the past thirty years, five million unborn children have been aborted legally in England and Wales alone. Most were killed simply because they were unwanted. In 2000, 92% of abortions took place because the baby posed a “risk of injury to the physical or mental health of the woman”. The words are taken from the Abortion Act: they cover any situation where the mother says she would be unhappy if the baby were born. Only 1% of abortions are carried out because of a “substantial risk of the child being born seriously handicapped”. In the year 2000, just one was carried out “to save the life of the pregnant woman”. The media hide the facts of abortion. TV channels can show homosexual men carrying out the most perverted acts. Apparently that offends nobody. But they won’t let viewers see what it means to abort a baby. They say that that would be offensive or distressing for some viewers. It’s OK to kill babies. It’s not OK to let people know the truth about it. I wish we could close our eyes too. We would rather forget these ugly facts. Writing this letter distresses me. I hope that reading it distresses you. It should. God is distressed by these things. He has a special concern for the vulnerable, the helpless, the unborn child. Amos prophesied against the people of Ammon; their greatest crime in God’s eyes was that they waged war against unborn children: “For three sins of Ammon, even for four, I will not turn back my wrath, because he ripped open the pregnant women of Gilead in order to extend his borders” (Amos 1:13). What is our responsibility, living in a society that commits such crimes? Firstly, we must be clear in our own minds. The Bible leaves us in no doubt that unborn children are part of the human race. We’ve already quoted Psalm 139. Remember David’s cry of conviction (Psalm 51:7): “Surely I was sinful at birth; sinful from the time my mother conceived me..”. John the Baptist was “filled with the Spirit from his mother’s womb..” (Luke 1:15). Above all, think of the Lord Jesus: from the moment he was conceived in Mary’s womb, he was God made flesh: “The Holy Spirit will come, and the power of the Most High will overshadow you. So the holy one to be born will be called the Son of God”. Jesus did not become the Son of God when he was born. He was conceived through the overshadowing of the Holy Spirit. Scientists and philosophers may debate at what point an embryo becomes a full human person. But we know that from the moment of his conception, the Lord Jesus was worthy to be worshipped as the God-Man. Secondly, we must make the facts known whenever we have opportunity. It’s time to break the conspiracy of silence. “Speak up for those who cannot speak for themselves..” (Prov 31:8). Thirdly, we must support “pro-life” – ie anti-abortion – pressure-groups – especially those with a Christian foundation. A small number of people who campaign single-mindedly, can have huge influence (think about the way the “gay lobby” or the “anti-smackers” have succeeded in shifting attitudes). In the USA, evangelical Christians have kept the issue of abortion at the top of the political agenda for many years. No American politician can afford to ignore them. And at last, the battle seems to be moving in their direction. President Bush is now in a position to appoint pro-life judges to the Supreme Court. If that happens, then abortion on demand may well become a thing of the past in America. We’re a long way from that here. But there are Christians campaigning on the issue – and they deserve our support. I’ll list some addresses at the end of this letter. Fourthly, we must be ready to offer support to women who are wrestling with the question of abortion. A teenage girl finds she’s pregnant. Her boyfriend doesn’t want the responsibility and walks away. Her parents tell her that if she doesn’t “get rid of” the baby, they’ll turn her out of the house. To whom can she turn? Would you be prepared to give such a girl a place in your home while her pregnancy runs its course? The Life organisation sees it as one of the most important aspects of its work: to offer counsel, support and practical help to such women. What part could you and your family play in that? Finally – most important of all – we must be aware of the millions of women around us whose lives have been wrecked by abortion – and we must be ready to preach the gospel to them. 40% of the women in our society will have an abortion at some point in their life. Many of them are left crippled with guilt and shame. It’s not enough to say “Abortion is wrong”. I must be ready to talk to those women as one sinner to another, and to say “The blood of Jesus Christ cleanses from all sin”. We have good news for every man, woman and child who knows they have broken God’s laws. “I have found forgiveness in Christ and so can you”. I don’t know who may read this letter. Maybe you yourself have had an abortion. Or maybe you pressured your wife or your daughter into doing so. Maybe you’ve lived with guilt and regrets for many years. Maybe the burden is crushing you. Jesus said, “Come unto me, all you who are weary and heavy-laden, and I will give you rest”.